Each year our family buys a special ornament for our Solstice Tree. My husband and I pick out one to share, along with each child picking out their own. Right now our tree is gaining these ornaments at a fast rate, but the day will come when our children are grown and take their ornaments with them. When that happens, our tree is going to look rather bare. So each year, we also make ornaments. 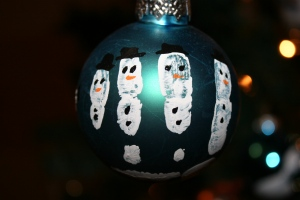 My absolute favorite ornaments last year were the handprint snowmen ornaments we made. We made two for each child: one for us to keep and one that will go with our children. They grow up so fast, and I am so happy that I will have these to look back on. I even got a little crazy, and we made a set for my husband’s parents. These are exceptionally easy to make. If you aren’t a crafty sort, you can find a step-by-step tutorial at Little Bit Funky. You just need white acrylic craft paint, round ornaments, fine-tipped permanent markers to add details, a sponge brush, an egg carton to set them to dry, and one or more tiny hands! This post was rewritten from one originally posted at Living Peacefully with Children. Photo by author. I have been searching all day for a craft to make as gifts for the grandparents….THANK YOU for this, we will be making them tomorrow!